After a beautiful and sunny day, we are back to the grisaille, which literally translates to “greyness”, the good thing about this type of weather is that you can stay home and cook. hat would be the positive thing. I have really never experienced the San Francisco summer, and it can be overwhelming if you need the natural light to enhance your spirit. This summer has been quiet in terms of business, but it will pick up in the fall. Usually in summer I am in Europe, visiting my family but this year I will probably go home a little later. What about a nice tartine of salmon enhanced with lots of various fragrant herbs on a slice of toasted baguette? It will color your day. It surely did color mine. The first time I made those toasts, I used smoked salmon instead of fresh, on small toasted baguette as an amuse-gueule or amuse bouche as they would say in the US, and everyone loved it. You can use either fresh salmon or smoked, depending on what you feel like. I put it on toasted bread but you can serve it on a plate, and on top of a mâche salad and with a slice of bread on the side. You can play with it. It’s very versatile. Broil salmon under broiler. When cooked all the way through, remove and shred in medium size pieces and place in a mixing bowl. For the dressing, add olive oil and all other ingredients and mix well. Add on top of salmon, adjust with salt and pepper. Toast a slice of baguette and add salmon on top. This entry was posted by silvia on August 11, 2009 at 8:08 am, and is filed under Appetizers, Express - Less than 30 minutes, Fish/Seafood. Follow any responses to this post through RSS 2.0.You can leave a response or trackback from your own site. This is a great snack. 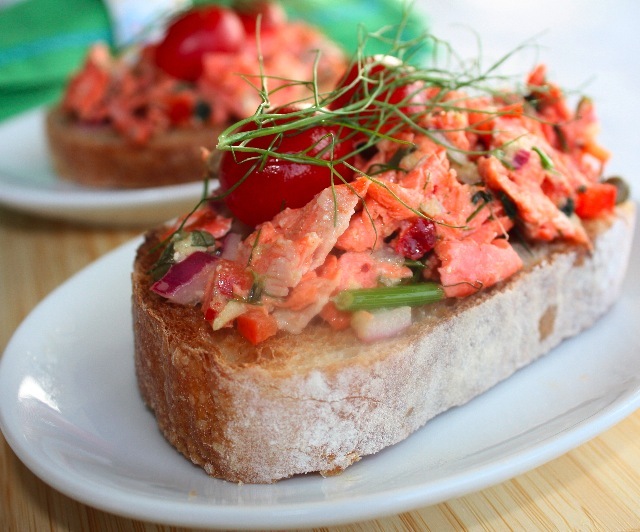 I can’t take my eyes from the colors on this toast.Anything with herbs or salmon is enough to make my mouth water. Thanks Zerrin! I’m so excited that my toasts made it all the way to Turkey! Now that is my kind of recipe! The photo is gorgeous and the flavors sound amazing. I have all of these ingredients in my fridge right now, so I am going to make this tonight! omg! you’re killing me here! I love salmon. This dish looks & sounds amazing.